Alvin Attles Jr. was born November 7, 1936 in Newark. Al attended Weequahic High School in the early 1950s. Sid Dorfman, a legendary Garden State sportswriter, was a year ahead of him. Al stood an even 6 feet. He was a quick and powerful guard whose anticipation and toughness made him especially good on defense. At the time he graduated, major college scholarships for African-American basketball players were few and far between. He ended up attending North Carolina A &T, a school located in Greensboro—one of the hotbeds of the Civil Rights movement. What was the Newark connection? The team’s coach was Cal Irvin, brother of Newark baseball star Monte Irvin. NCA&T was part of the Central Intercollegiate Athletic Association, which was made up of historically black colleges in North Carolina and Virginia. With Al leading the way, the Aggies won the CIAA championship in 1958 and 1959. In 1960, Al was selected with the 39th pick in the NBA draft by the Philadelphia Warriors. As a rookie he backed up two of the league’s best guards, Tom Gola and Guy Rodgers. Often, coach Neil Johnston inserted Al as a defensive stopper. The Warriors’ star player was Wilt Chamberlain. In 1961–62, Wilt averaged 50.4 points a game and scored 100 against the Knicks. That season Al saw a lot of action, as Gola was hampered by a hand injury. Al averaged 11. 3 points and 4.4 assists playing about 30 minutes a game most nights. The Warriors moved to San Francisco in Al’s third season. One year later, the team made it all the way to the NBA Finals, but lost to the Celtics. Midway through the 1964–65 season. San Francisco traded Wilt Chamberlain. The Warriors fell into the cellar, but came back strong thanks to another New Jersey native, Rick Barry. Barry and center Nate Thurmond led the Warriors back to the NBA Finals in 1967. Ironically, they lost to Chamberlain and the 76ers. By this time, Al was entering his 30s and was a bench player. However, he remained a team leader. Al still was able to influence games with burst of defense and scoring. He was also being recognized as one of the smartest guards in the NBA. In 1970, Al broke his hand and spent almost half the season in street clothes. With the Warriors having a poor season, owner Franklin Meuli fired the coach and asked Al to lead the team. In 1970–71, Al guided the Warriors to a second-place finish as a player-coach, getting into 34 games in what would be his final season as an active player. The Warriors continued to improve under Al. They reached the 50-win mark in 1971–72 and in 1974–75 they finished first in the Pacific Division. That spring, the Warriors made it all the way to the NBA Finals. They played the Washington Bullets, a powerhouse team that many experts expected to sweep the series. The Warriors played great team basketball, made big defensive plays against the Bullets’ scorers, and swept the series. Barry, the team’s star, maintains it was the biggest upset in the history of professional team sports. 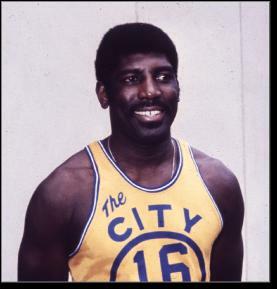 Al Attles received a great amount of credit for the victory, and rightly so. Getting NBA players to share the ball and buy into defense and rebounding is not an easy thing to do. Al continued to coach the Warriors into the early 1980s. In 13 full seasons at the helm he had only 4 losing records. In 1987, AL became the Warriors general manager. Today, he and Nate Thurmond work for the club as basketball ambassadors around the Bay Area.